Providing repeat scripts without an├é┬áappointment is solely at the discretion of your doctor. It is always best to see your doctor to obtain a prescription. Our doctors are unable to provide repeats if you were not seen for your├é┬álast prescription, or if your medication was changed at your last visit. Please note an appointment is always necessary for medications such as antibiotics, antidepressants and some pain medications. We will be in touch if you need to visit the centre before we can process your prescription request. If you would still like to proceed with your prescription request, please fill out and submit the form below. We will contact you by phone or email if an appointment is necessary, or if we need any additional information to issue the prescription. 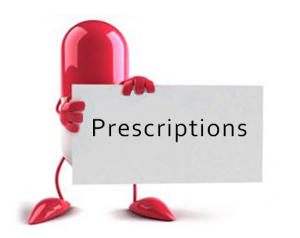 The turnaround time for repeat prescriptions is 48 hours (weekends and public holidays not included). If we have not contacted you within 48 hours of your request, please phone reception on 09 625 9221 to confirm that it is ready / has been sent. If you have already run out of medication, or are likely to do so before your prescription is ready, please contact your pharmacy and ask them to provide an emergency tablet or two to see you through. Remember, it is your responsibility to manage your appointments and medications appropriately.